If your looking to get out in the country a bit, and still want the community and safety a subdivision provides, you just found it at Avocet. Sitting on a mammoth 163 acres with its own 7 acre lake. 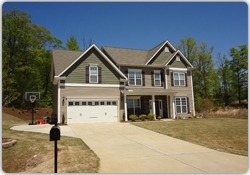 Homes in Avocet range from 2600 to almost 4000 square feet, including an unparalleled list of standard features, such as hardwood floors, ceramic tile baths, open concept kitchens with granite countertops, smart home technology and security features as well as sealed crawlspace foundations and James Hardie Color plus siding. The newest phase of Avocet is now open and features large wooded home sites from 1/3 to ½ acre. Each lot backs up to preserved natural open space for privacy and a limited number of lake front lots are also available. Click here to view site plans.